At an auction house, they are unpacking an Elizabethan Collection, when the workers come across the journal of John D, the royal sorcerer supreme. Who should arrive but Solomon Kent? He of course takes the journal, though the security guard and auction house employee try to stop him. For their troubles, they end up dead for their troubles. In the meantime, Abby gets an urgent text to meet Ichabod. Upon arrival, Abby learns that Ichabod is house hunting. Ichabod is not at all pleased by the so-called huxterism i.e. fake fruit and other dressing employed to attempt to sell the house. When they leave, Abby points out that to buy a home, Ichabod will need credit rating, bank approval and yes, an income. Speaking of which, how long is Abby going to continue to support both Crane and that wretched wife of his? Crane admits that Abby has been generous but adds that he is going to need a place of his own. Abby hands Crane the file from the robbery of the auction house and Crane takes notice of the missing journal. When Crane admits he is no expert, Abby says that there is a specialist in this department. Abby and Crane head to see Katrina, who is working on her magic, saying that she is recovering from 200 years in purgatory. Does this mean Katrina is finally going to do something useful for a change? We keep hearing that she is a powerful witch but haven't seen her actually do anything to prove it thus far. Abby hands over a picture of the grimoire which Katrina calls powerful and dangerous. Katrina thinks that someone drew it to this place and Ichabod suggests that it might be another tormented soul set loose. Of course, the Cranes take time to talk about their baby the freaking horseman of war. Speaking of baby Crane the horseman of freaking war, he is holed up in a motel watching infomercials of all things. The station then shows the Auction House theft. It seems that Parish is experiencing some regret for his action. If they rehabilitate his character to make Katrina right, I swear, I will spit my damn dummy out. Back at the archives, Abby and Crane discuss the forensics at the scene. Crane says that the sorcerer uses blood magic and it is one of the dark arts which taps into evil sources. They then look at the security camera footage from the Auction House and Katrina instantly recognizes Solomon Cant - the warlock all witches fear. Katrina surmises that Moloch's death must have freed him from purgatory and now he is in their world. Solomon in the meantime has not wasted any time opening the grimoire and starting a spell. At the archives, Katrina reveals that Solomon was one of the leaders of the town of Salem - yes, that Salem. It's flashback time and we see Solomon amongst the Puritans, smiling an interacting with them, in particular Katrina's grandmother. Apparently, Kent became infatuated with Sarah Oswald and healed her hand after she cut it. Unfortunately for Solomon, Sarah had an eye for someone else. Solomon accidentally kills Sarah and rather than face the punishment, Solomon changes Sarah's face to make it appear evil. Once discovered, Solomon tells the people that he acted in self defense and that there are witches amongst them. Katrina's grandmother begs Solomon to stop but instead he turns on her and labels her a witch in front of the people. Ichabod questions how Kent survived the witch trials unscathed but it seems that eventually the coven hunted him down and put him into purgatory. At the Auction House, Ichabod questions why Kent drew the grimoire to him. Katrina does her thing and says that she cannot locate the grimoire but John D bound the grimoire with a spell, blocking anyone from using it unless the book was whole. Once again, Katrina's magic cannot help Crane and Abby. Katrina believes that whoever handled the book must have the missing pages. Abby declares that they have to find the person who handled the book before Kent. Abby is walking down the street and pulls her gun when she senses someone following her. Irving says that Abby is losing her edge because he has been following her for awhile but adds that he wasn't trying to sneak up on her when Abby does not lower her gun. Frank admits being angry with Abby for not trusting him, after all he has done but Abby points out that his soul was stolen by a horseman of the apocalypse. Frank reveals that Katrina has declared his soul clean and adds that she doesn't blame Abby for not trusting him. Frank tells Abby that things are good between them and starts to walk away. Parish has returned to his motel room to find Ronnie fixing his faucet. They talk about Ronnie's mother's disability and of course Parish snarks that father's are never what they're cracked up to be. Yes, Parish still has daddy issues. Back at the archives, Abby tells Ichabod about her meeting with Irving and Frank's vow to move on. Ichabod says that Kent may not be able to let go of his mistakes and everything that he has lost. Ichabod then reveals that there is a resurrection spell in the grimoire. Abby points out that once the gates of the afterlife are open, they are not easily shut. Crane is concerned that if Kent opens the gates, the world of the living will be overrun by the dead. Abby and Crane head to the warehouse, waiting for Katrina to do her grimoire tracking thing. Abby points that Crane has a lot in common with Solomon because they are both men out of time, unwilling to give up on the woman they love. Crane is not pleased to be compared to a murderous warlock but if the shoe fits etc,. However, Abby softens the blow by telling Crane that he made the right choices. Really? Staying with the lying, manipulative Katrina is the right choice? Crane says that they are fighting for love, family and a life. Crane and Abby then sneak up on Cant, weapons pointed and Solomon turns and aims a beam of magic at them. Katrina comes out from between the crates and tosses a flash of magic at Cant, declaring that she will stop him because Helena's blood runs through her veins. Solomon declares that the witches have agency in this world because of him, adding that Katrina has seeds of darkness within. Katrina of course experiences a moment of self doubt, as you do when faced with an evil warlock. Cant suggests that Katrina's magic fails because she is walking the wrong path and is not one with herself. Crane and Abby start to sneak up on Cant, as Katrina engages him but he slits his arm and calls forth creatures out of his blood. Cant uses the distraction to find the missing page from the grimoire. Katrina vows that she will stop Cant but asks Ichabod and Abby to keep the other demon at bay. Cant begins to work on the spell and Katrina blows some herbs at him. Abby and Crane make short work of the second demon and decide to head back to Katrina. Cant throws another beam of magic at Katrina, saying that though she is formidable but because she resists her true potential, Katrina cannot find her true self. Katrina stands growling and her eyes go white, which causes Kant to smile. Once Katrina realises what she has done, she stops and Cant leaves. Katrina then informs Abby and Crane that Cant has the complete grimoire and that she is no longer a match for the power of his magic. Big surprise there. BTW who the hell gets turned so easily? Back at the cabin, Abby asks if Katrina is able to sense the grimoire and she says that she cannot and will need time to recover. Recover from what exactly? Abby leaves to check on a few things, suggesting that Crane and Katrina come up with a plan B. Katrina admits to Crane that there are elements to her magic she has not explored, when he notes how shaken Katrina looks. I cannot believe this woman is playing delicate wilting flower yet again. Abby heads to the bar to meet up with Frank. Abby asks what Frank remembers from coming back and if there was a secret location. Frank responds that he has no clearly memories. Abby admits that they might be dealing with an undead problem and Frank is the closet thing they have to an expert on the topic. Frank suggests that Katrina should be his person but Abby admits that Katrina is out of commission. Frank gives a pep talk about how Crane and Abby have to keep fighting and not make excuses. Abby tells Frank that it's good to have him back before leaving. Parish is doing a crossword puzzle, when he hears a problem in another room. Ronni and Mary are forced to walk away when confronted by thugs and when the thugs suggest Parish come downstairs for a better view, he returns to his room. Abby is back at the cabin where Ichabod reveals that they are going to have to defeat Kent without Katrina's magic. Well, what else is new? Abby points out that before the arrival of Katrina. they took on all threats without magic. Abby reveals that there are no zombies roaming the streets according to the police scanner, so they might be wrong about Solomon's objective. Crane reveals that when Kent faced off against Katrina he uttered the phrase, "I am the traveler." Apparently, Abby's great grandmother Grace, wrote about this, saying that it allows the traveler to jump into the past. Ichabod is worried that if Kent goes back in time that he could rewrite history, thus changing their lives and their family. My question is, would it really be so bad if it meant we were finally rid of Katrina? Abby and Crane realise that Cant will need to use the ley lines. Abby grabs some weapons, as Ichabod worries that it won't be enough to stop Solomon. Frank arrives, saying that they will have to make their own magic then. Abby explains that she asked Frank to join them because they are short handed. Ichabod explains to Frank that Solomon is a powerful warlock who uses blood magic. Abby says that they are going to need a generator and a fire hose to mimic Katrina's magic. Ichabod is insistent that he will face Kent and prove his commitment to the cause. Solomon is in the woods with the book and starts his spell. A portal opens and Sarah quickly becomes visible. A small explosion closes the portal and Ichabod walks out of the wood telling Solomon that he does not belong here. Solomon yells that he won't be stopped by tricks and has defeated Ichabod's spell caster (well of course he has, when has Katrina been useful?) Frank manages to shoot Solomon with a drug which causes hallucinations. When Cant steps into a puddle, Abby electrocutes him. Crane steps forward and starts beating Cant, saying that he brought harm to Katrina's family, Katrina, and of course him. Abby has to stop Ichabod from beating Cant to death. Abby notices that Frank is now missing, so she and Ichabod take off into the woods to find him, leaving Cant unconscious. Frank however has doubled back. Frank takes the book off of Cant and then breaks Solomon's neck, putting the grimoire in his waistband. Frank then calls out for Abby and explains that Cant disintegrated. Frank calls it a good one, saying that the grimoire must have disintegrated with Cant. Ichabod and Abby smile, then walk out of the woods with Frank. Back at the archives, Abby admits to Crane that she was surprised by the brutality he aimed at Cant, snarking that she needs a reminder not to attack Katrina. Ichabod says that he is disturbed by how easily a person can betray those who trust him (badly written foreshadowing there) and that when Abby claimed that he reminded her of Cant, it made him realise that everyone is walking a fine line between darkness and light. Abby suggests that they have a drink and when they leave, Katrina makes her way out of the bedroom. Katrina uses her magic to levitate and then turn a flower into stone, only to destroy it. Parish goes to see the bullies who were bothering Ronni and Mary and tells them that he killed his father and since then, has felt nothing but crushing regret. Watching the bullies threaten Mary and Ronnie, he was drawn to them momentarily but remembered that there will always be sheep and wolves and that he is a wolf. Parish uses his magic to kill the thugs and smiles in satisfaction, before turning on his heel and leaving. Parish makes his way into the woods and meets Frank. The two men shake hands and Frank hands over the grimoire, announcing that Abby and Ichabod trust him again. Frank asks if Parish plans to use the grimoire to fulfill Moloch's vision, only to be told by Frank that he is no longer the horseman of war and that destiny now bends to his will. Okay, obviously this episode was a continuation of repairing the damaged relationship between Crane and Abby. I like that they are coming back together and both acknowledging that Katrina is pretty useless to them. 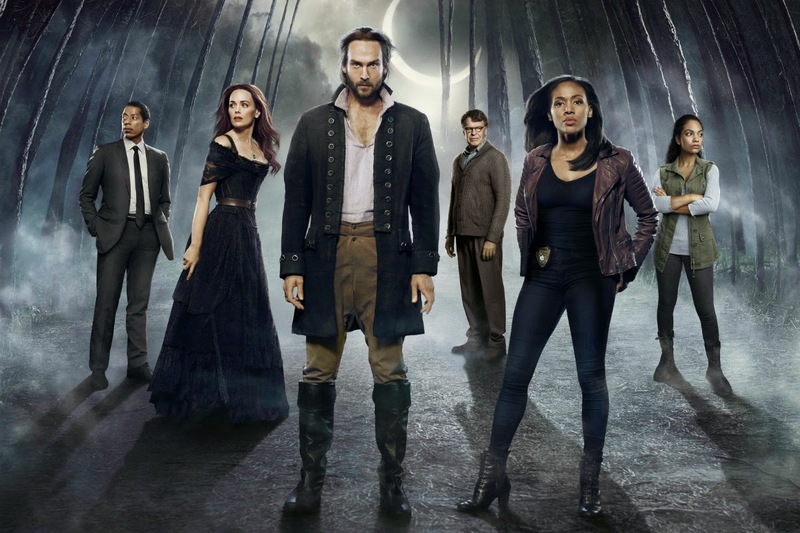 I want to see their friendship grow to what it was before the writers decided to #cranewreck Sleepy Hollow. Onto the shipwreck that is Katrina. The woman plain and simple gave up. Who does that? No, seriously, who? Solomon said one sentence to Katrina and immediately she started doubting herself. If that were not enough, she let Solomon get away with the grimoire pages and then through her hands up in a bid of weakness. Every time Katrina has had the chance to prove that she can be a strong member of the team, she accomplishes nothing and in fact, creates more problems. The upside to Katrina's supposed embracing her bad side is that Crane and Abby will be forced to kill her and we will be rid of her wretched character. Perhaps, Katrina will join baby Crane in evil and they can wallow in it together. I am pleased to see Frank back but disappointed that he is going to be a traitor to Abby and Ichabod. This is not going to end will for his characters, particularly given the fact that in the past, neither Crane or Abby have gone out of their way to help Frank, despite all that he has done for them. I think they are more likely to fight to save the useless Katrina than they are to fight for Frank. Also, where the hell was Jenny this week? There was no explanation as to why she was dropped into the damn plot box. Was it so that Abby would be forced to turn to Frank? Truth be told, Jenny, Frank, Abby and Ichabod make a great team. I want to see them working together again.